In 1997, the NHL expanded to Ohio bringing the Columbus Blue Jackets into the league [hitting the ice in 2000]. With the team less than two decades old, it’s no wonder they have yet to experience true glory in the form of a Stanley Cup Finals berth – let alone a championship. But that hasn’t stopped the team from icing some impressive teams and players. They may have let guys like Jakub Voracek and Rick Nash go, but they team is still committed to young talents like Ryan Johansen and Boone Jenner. While the youth movement has become a prominent one in today’s NHL, the teams veteran’s and young players both find ways of moving up the franchise and all-time statistical categories. 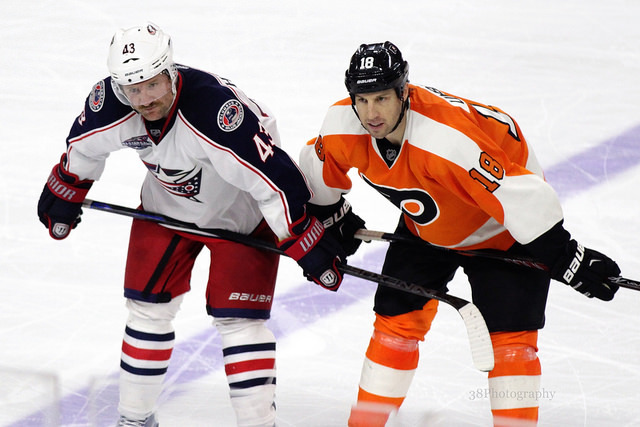 When Scott Hartnell was added to the Blue Jackets lineup in the offseason, it was a move that gave the team some toughness up front and in front of the net. But no one really discussed the individual milestones and accomplishments that came with the big grizzly forward. In fact, as one of the veteran players on a seemingly young team, Hartnell is in search of numerous personal marks – ones that the young players like Johansen are a few years away from accomplishing. Having only been around since 1997, the Columbus Blue Jackets don’t have the deepest history – at least when it comes to statistical rankings. Regardless, it’s no surprise that current Ranger, Rick Nash, sits atop most offensive categories on the Jackets’ all-time lists. However, it won’t take long for Johansen to be in the hunt for the franchise marks. On top of that, he won’t be the last player to climb the ladder in these statistical categories. Jared Boll (492) needs 24 games played to pass Rostislav Klesla (515) for 3rd on the team’s all-time list. Fedor Tyutin (488) needs 5 games played to pass Jared Boll (492) for 4th on the team’s all-time list. Ryan Johansen (271) needs 5 games played to pass Marc Method (275) for 17th on the team’s all-time list. Sergei Bobrovsky (147) needs 86 games played to pass Steve Mason (232) for 2nd on the team’s all-time goalie list. Curtis McElhinney (60) needs 12 games played to pass Mathieu Garon (71) for 7th on the team’s all-time goalie list. Anton Forsberg (5) needs 5 games played to pass Martin Prusek (9) for 14th on the team’s all-time goalie list. Ryan Johansen (73) needs 4 goals to pass Nikolay Zherdev (76) for 5th on the team’s all-time list. Cam Atkinson (59) needs 3 goals to pass Antoine Vermette (61) for 8th on the team’s all-time list. Nick Foligno (55) needs 3 goals to pass Tyler Wright (57) for 12th on the team’s all-time list. Matt Calvert (42) needs 2 goals to pass Mark Letestu (43) for 16th on the team’s all-time list. Fedor Tyutin (144) needs 61 assists to pass David Vyborny (204) for 2nd on the team’s all-time list. Ryan Johansen (94) needs 2 assists to pass James Wisniewski, Jakub Voracek and Ray Whitney (95) for 7th on the team’s all-time list. Jack Johnson (84) needs 1 assist to pass Kristian Huselius (84) for 14th on the team’s all-time list. Nick Foligno (76) needs 5 assists to pass Geoff Sanderson (80) for 17th on the team’s all-time list. Brandon Dubinsky (75) needs 2 assists to pass Nick Foligno (76) for 18th on the team’s all-time list. Fedor Tyutin (182) needs 69 points to pass R.J. Umberger (250) for 3rd on the team’s all-time list. Ryan Johansen (167) needs 2 points to pass Geoff Sanderson (168) for 7th on the team’s all-time list. Nick Foligno (131) needs 3 points to pass Rostislav Klesla (133) for 15th on the team’s all-time list. Cam Atkinson (112) needs 2 points to pass Sergei Fedorov (113) for 18th on the team’s all-time list. Ryan Johansen (17) needs 3 powerplay goals to pass Kristian Huselius and Derick Brassard (19) for 6th on the team’s all-time list. Nick Foligno (15) needs 2 powerplay goals to pass Ron Hainsey and James Wisniewski (16) for 10th on the team’s all-time list. Cam Atkinson (13) needs 2 powerplay goals to pass Steve Heinze and Ray Whitney (14) for 14th on the team’s all-time list. Fedor Tyutin (11) needs 2 powerplay goals to pass Mark Letestu and Antoine Vermette (12) for 18th on the team’s all-time list. Cam Atkinson (13) needs 3 game-winning goals to pass R.J. Umberger (15) for 3rd on the team’s all-time list. Ryan Johansen (10) needs 3 game-winning goals to pass Jason Chimera and Geoff Sanderson (12) for 5th on the team’s all-time list. Nick Foligno (10) needs 1 game-winning goal to pass Manny Malhotra and Ryan Johansen (10) for 7th on the team’s all-time list. Matt Calvert (7) needs 2 game-winning goals to pass Dan Fritsche, Mike Sillinger, Kristian Huselius, Antoine Vermette and Derick Brassard (8) for 13th on the team’s all-time list. Boone Jenner (7) needs 1 game-winning goal to pass Freddy Modin and Matt Calvert (7) for 18th on the team’s all-time list. Sergei Bobrovsky (83) needs 2 wins to pass Marc Denis (84) for 2nd on the team’s all-time list. Curtis McElhinney (22) needs 1 win to pass Mathieu Garon (22) for 7th on the team’s all-time list. Sergei Bobrovsky (11) needs 2 shutouts to pass Marc Denis (12) for 2nd on the team’s all-time list. Curtis McElhinney (2) needs 4 shutouts to pass Mathieu Garon and Fredrik Norrena (5) for 6th on the team’s all-time list.